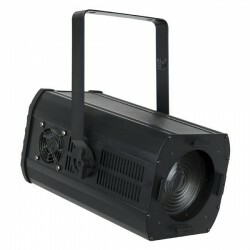 Professional LED theaterspot with a high power output. It can be controlled by DMX or manual on the backpanel, the settings are user friendly set with a menu and display. The beam angle is adjustable from 25 until 75 degree and due to the refreshrate of 400Hz suitable for TV studio´s.